Dr. Peter Jay Hotez, renowned professor in the Departments of Pediatrics and Molecular Virology and Microbiology at Houston (Texas) Baylor College of Medicine and Dean of its National School of Tropical Medicine, met with two Hadassah Medical Organization infectious disease specialists to discuss regional cooperation in fighting tropical diseases, such as the now-infamous Zika virus and leishmaniosis, which is contracted from sand flies. 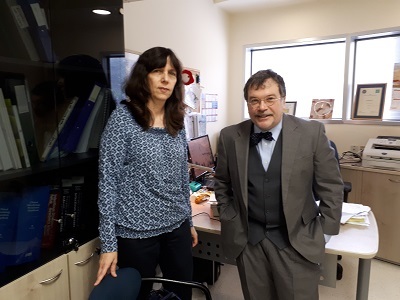 The Hadassah specialists are Prof. Allon Moses, Director of Clinical Microbiology and Infectious Diseases, and Prof. Dana Wolf, head of Hadassah’s Clinical Virology Unit and Specialist in Infectious Diseases (pictured above). Prof. Wolf, who is a world-renowned specialist in viruses and the damage they can cause to fetuses, recently opened a new laboratory dedicated to defeating Zika. Under her leadership, the Clinical Virology Unit at Hadassah has been recognized as a National World Health Organization Collaboration Center. 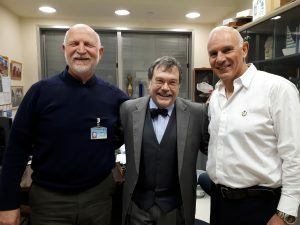 Dr. Hotez, who was visiting Hadassah as part of his trip to Israel hosted by the United States Embassy, was accompanied by Prof. Avi Israeli, head of the Department of Health Policy, Health Care Management, and Health Economics at the Hebrew University-Hadassah Faculty of Medicine.